Creating a thru-hike-worthy trail ranks as one of the hardest challenges in the outdoors. It takes decades to wrangle government agencies, assemble trail crews, raise money, and establish an organization that will maintain the trail. It’s a wonder we have any long trails at all. Yet not only do we have long trails, we&apos;ve got a country of them. 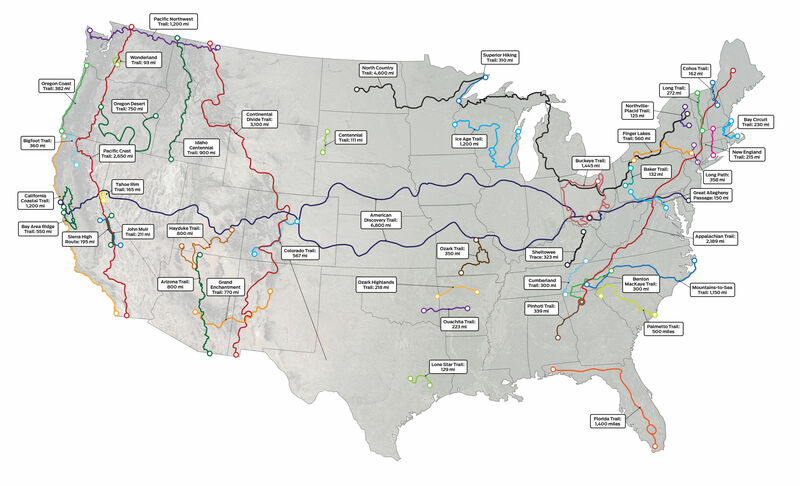 Of course there’s the Triple Crown—the Appalachian Trail, Pacific Crest Trail, and Continental Divide Trail—and dozens more, spanning tens of thousands of miles. Whether you want to hike for six days or six months, start your search here. Got the itch? Get ready for your first-ever thru-hike by joining our Thru-Hiking 101 course. Too small to read? Click here to blow it up. Sample a 15-mile stretch of the Long Trail on this challenging leg between Appalachian Gap and Duxbury Road. Expect steep scrambles, big elevation gains, and sweet views.